As we have seen in the myth of Pegasus and Bellerophon, in antiquity the application of the bit was considered a decisive moment for the horse’s submission to the will of the rider. It is believed that the first rudimentary mouthpieces were made of perishable materials, such as horsehair strings, or bone. The oldest metal bits date back to the Bronze Age and were conceived according to a principle similar to that of the modern snaffle, i.e. they consisted of a cannon (rigid or jointed) exerting direct pressure on the bars, to which the reins were secured by metal rings. Generally, this sort of snaffle had a width exceeding (12-20 cm) those of the ones that are used today (10-15 cm). Because of these dimensions they exercised more pressure on the sides of the mouth, with a more severe effect than the current snaffles. Both the Greek civilization and the pre-Roman world ignored the use of the curb bit (i.e. 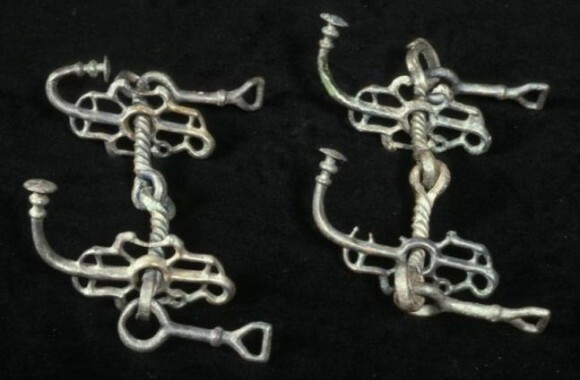 with long leverage–arm and curb chain), which is believed to have been introduced by the Celtic people, between the fourth and third century BC. Its use would be adopted later by the Romans through the influence of the Gauls, and would spread in the Hellenistic world after the Gauls invasion of the Balkans in 279 BC. The people of the Mediterranean, however, also knew the use of halters (phorbeia) and cavessons, which were used to conduct the horses in hand and to tie them in the stables. It is also conceivable that they were used to drive chariot horses. The harnesses found with a chariot in the tomb of the Egyptian pharaoh Thutmose IV, in fact suggest that the horses were driven with a sort of cavesson, which exerted pressure on the nostrils of the animals. 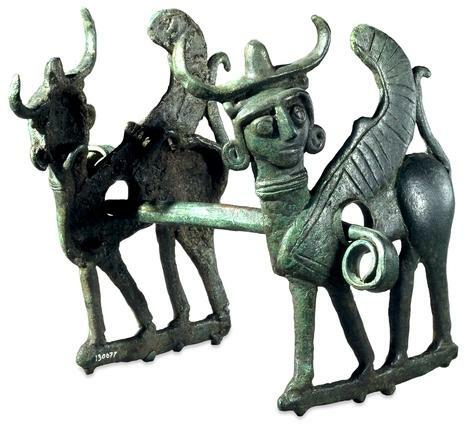 Some of the oldest surviving bits comes from Luristan, a region in western Iran on the Zagros Mountains, and are dated between 1000 and 700 BC. They are made of bronze and they consist of a cannon of a single piece, straight or slightly curved, with at each end a cheek piece in the form of a winged animal. These figures of animals had a large hole in the body, in which passed the end of the mouthpiece, and two loops to tie the bridle and the rein. These remains were found mainly in tombs in which they were placed under the head of the buried body. Signs of wear on these bits, however, suggest that they were actually used – though probably only as parade accessories – and that they were not mere funeral offerings. Bits with zoomorphic cheek pie­ces, were found also in Italy. The oldest belong to the so-called Villanovan culture, which flourished in central Italy (in the Tyrrhenian Etruria, Emilia Romagna and Marche, and also to the south, in Campania and Lucania) between the ninth and eighth century BC. They were part of the funeral offerings in the characteristic shaft tombs in which the deceased’s ashes were housed in an urn. In this case, however, they were jointed bites, decidedly less severe then the oriental models. A bit with a rigid cannon, dating back to the late Bronze Age, found in the site of Tell el-Ajjul, near Gaza in Palestine, identifies another typology of bits, relatively widespread in ancient times. In this case, the cheek pieces are drilled bronze discs, through which passes the cannon, studded with spikes on their inner face. The cheek pieces were used to prevent sideways movements of the bit in the mouth, while the spikes strengthened the coercive action of the bit on the horse. The reins were secured to metal rings inserted in small holes at the ends of the cannon. This kind of bit was probably used for war-chariot horses. In his historical and geographical work titled Indika, the Greek historian Arrian of Nicomedia says that bits with circular cheek pieces and internal spikes were also used in India at the time of Alexander the Great (fourth century BC). Jointed bits with similar cheek pieces, but without internal spikes, were found in Greece and Asia Minor. Their operation was very similar to that of a modern snaffle. In Italy, Etruscan (or Villanovan) bits from the eighth century BC were found perfectly preserved. Of particular interest are the pairs of bits found in some burials in central Italy, especially the pair found in the tomb number 39 of the Benacci Caprara cemetery in Bologna. They are two bronze snaffles with elegant openwork cheek pieces. The jointed cannon, as in many other ancient bits, is “twisted”. According to some scholars, this kind of cannon evokes the memory of the time when horsehair strings, or other resistant fibers, were used as mouthpieces instead of metal. It seems to us more reasonable to think that instead the grooves serve to improve the effectiveness of the cannon on the horse’s bars and then to make the bit more severe. The hypothesis seems confirmed by the spread, in ages immediately following, of mouthpieces in which the action of the cannon on the bars was further strengthened by spikes. 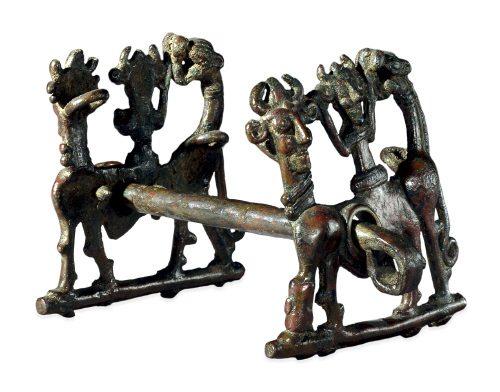 The two snaffles, preserved in the Archaeological Museum of Bologna, were part of an Etruscan funerary outfit dating from the seventh century BC (the date of the tomb is estimated between 750 and 720 BC). Note that in the Italian burials of this period the bits were always in pairs, because they were intended for a pair of horses attached to light chariots. 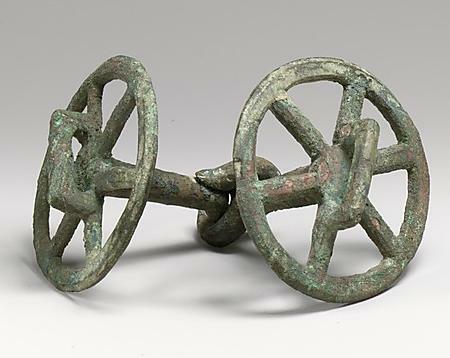 In the tomb were also found bronze pins and hub locks of the chariot’s wheels, that were probably burned on the funeral pyre with the body of the deceased. If in earlier times, in the area of Bologna, the bits were exclusively part of male funerary outfits, from the end of the seventh century BC they appear also in some particularly rich female burials. 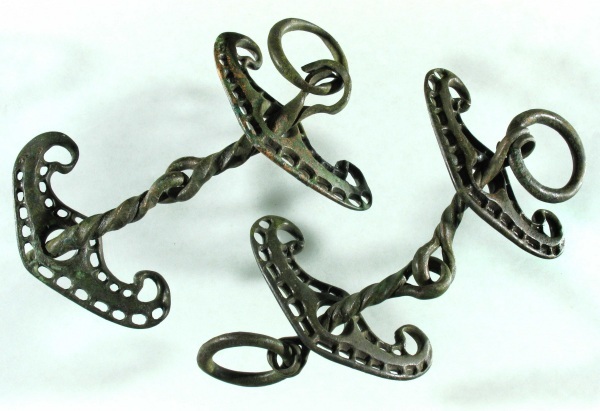 In the same area we note another couple of bronze snaffles, found in excavations at the end of the nineteenth century, in the Pradella farm in Castelfranco Emilia, near Modena. They are a variation of the two bits from Bologna, with pelta, or waxing moon cheek pieces. It is a kind of bit relatively widespread in the area of Emilia, in both male and female tombs.